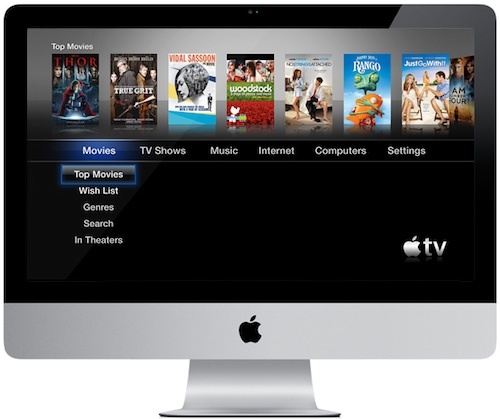 Next-Generation iMac to Potentially Offer Television Functionality? Forbes reports on a new research note from Wedge Partners analyst Brian Blair suggesting that Apple may bring some aspects of its rumored television set to the iMac with a revision in the first half of next year. Blair envisions the company pushing the largest screen sizes of the iMac toward the TV market by integrating Apple TV and iCloud features into a slimmer all-in-one PC with TV capabilities. While the full context of the claim is not included in the Forbes report, the claim is referred to as "speculation" on Blair's part and no specific evidence to support it is offered. Apple had previous offered its "Front Row" software for OS X, providing users with a full-screen media display to allow easy access to content while interacting with their Mac via the remote control previously included with most Macs. Front Row debuted on the iMac in 2005 and made its way throughout Apple's Mac lines, but was gradually phased out until it was completely removed in OS X Lion. Apple is said to be developing a television set product featuring Siri-powered voice input, with a release rumored for late 2012 or 2013. An iMac offering some of that television functionality could bridge the gap to the dedicated television set, with the 21.5-inch and 27-inch screens on the iMac suitable for smaller-scale television settings. Apple will do away with buttons of any sort by the middle of 2012. The iPad will fail because it's just a giant iPod Touch. Apple will integrate TV functionality into the new Xserve machines due in Febtober. Nice to know that you just need a company to give you the title of analyst and whatever thoughts you put down about Apple will end up on Macrumors. Something for the youth of America to strive for I think. If I say I'm an analyst, could you publish my completely made-up guesses as news too? This makes a lot of sense. Most rooms in my house that have iMacs (garage, guest bathrooms, den, study, library, secret passageways in between the den study and library, servants quarters, and Bat Cave) are not wired for satellite or cable television and have a hard time pulling in an OTA HD signal. This would be perfect. Next iMacs will draw energy directly from the sun and the excess energy will be stored for night sessions, says Troll Toddington, analyst. Can we do rid of these stupid analyst threads please? Oh and the court case threads. Neither are interesting. NO, WHAT ARE YOU DOING FINGER? Ok finger. You got what you want. I'm going to say something negative in the thread to spite you though. Analysts pulling stupid ideas out of their asses again, shocker.